The issue opens with a montage of monuments and memories of Charles Victor Szasz. Cut to Renee and Tot discussing the dead rising. Tot, the scientist, is enthralled by an experiment related to the Black Lanterns when Renee hears something. Enter my favorite sociopath. (Heart leaps with joy; people in restaurant have no idea why I have such a stupid smile on my face.) My hope is requited, and Rucka and O’Neil delivered. Lady Shiva’s entrance was flawless. Now let’s get down to some martial arts, which is really the crux of this issue. We get to see the Renee/Shiva mashup. Renee reluctantly puts up a good fight, to which Shiva responds, “Adequate. Good. This will not be as boring as I feared.” Cue Renee, who responds, “Lady, you are ten pounds of crazy in a five-pound bag.” HA! I loved that damn line. During their duel/dance, Tot was busy with his science experiment, which, as far as I could tell, was concocting a Black Lantern ring all on his own. That led to the explosive arrival of Back Lantern Charlie, and just in time to distract Shiva from delivering her kill blow. It seems the nutbar really wanted to face the Black Lantern all along. You know, just ’cause. As BL Charlie looks upon Renee and Shiva, we see their true colors: Indigo and green, respectively. Perfect. A well-informed Shiva schools Renee that, “Not every battle ends with defeat of the enemy.” She then meditates herself into an emotion-free state, making her invisible to the Black Lantern. Pardon me while I log on to http://www.awesome.org/shivaissogangsta. Lady Shiva is like a masochistic (and way hotter) Yoda with proper syntax. Finally, Renee and Tot follow Shiva’s lead by letting go of their emotions for their dead loved one, thus becoming invisible. The Black Lantern takes off. Renee dons her costume, determined to follow the monster and stop it — which means we’ll be seeing more of her in this event. Works for me. 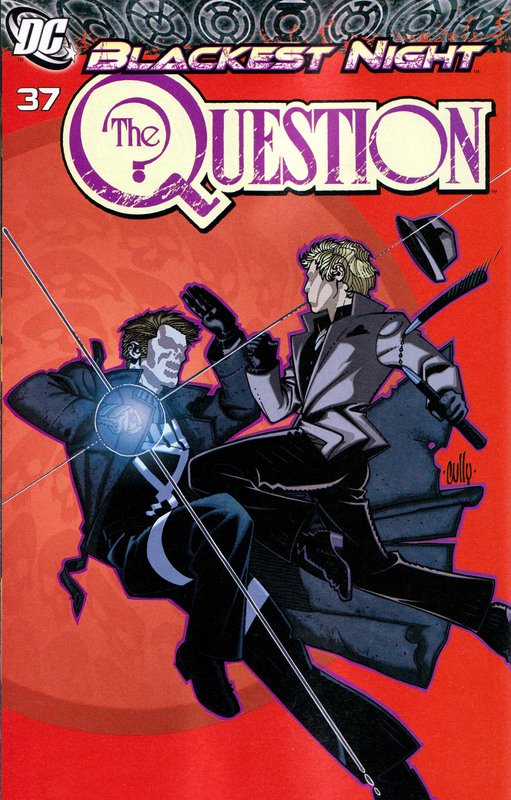 Overall, The Question #37 was an effing good read. Lady Shiva was treated properly, and the story was exciting. It was not what I expected, but the story was perfect for its characters. If you have even the tiniest bit of interest in Charlie, Renee, Tot or Shiva, it’s definitely worth your $2.99. I am familiar with the Vic Sage Question, and the art. I’ve also been reading the various DC titles “back from the dead” featuring their original writers and artists, so I get that concept too. I am also clear on how comic books are numbered, and that 37 follows the number 36. Different things appeal to different people. My opinion of the art is simply a matter of preference. What I find aesthetically pleasing…or displeasing is not necessarily a reflection on the talent of the artist. On my best day, I only wish I could draw like that. I do like Renee. I do like pretty faces. Sue me.